Arizona State University was recently honored with a 2014 Tree Campus USA award, which Gov. Doug Ducey presented to the ASU Grounds Services/Arboretum crew at the Arizona Capitol on April 23. The national Tree Campus USA program honors colleges and universities for promoting healthy trees and engaging students and staff in the spirit of conservation. To mark the occasion, we present a short tour of some of the Tempe campus' 1,000 varieties of trees. Shown here is a Southern live oak (Quercus virginiana) in south Cady Mall. The tree is native to the Eastern United States. If you want to see the trees in person, use this map to know what you're looking at. One of many jacaranda trees (Jacaranda mimosifolia) on campus, this tree stands near the Hassayampa Academic Village. A South American native, it boasts lush fern-like foliage and beautiful purple trumpet-shaped flowers. There are several plants on campus with edible fruit, including this pomegranate tree (Punica granatum), next to the Student Services Building. The weeping mulberry trees (Morus alba) on either side of the Old Main steps were planted more than 20 years ago. The Bursera Microphylla, or elephant tree, has a distinctive sculptural form, with a thickened, water-storing trunk. It is native to the Sonoran Desert. This particular example grows near Discovery Hall. There are several species of the orchid tree on campus. This is a detail of a Hong Kong orchid tree (Bauhinia blakeana) near the Student Services Building. It is a native of Southern China. Here, another Hong Kong orchid tree blooms on Tyler Mall. Netting protects the fruit on this peach tree (Prunus persica) next to Old Main from birds — and hungry students. The spongy bark of the cork oak (Quercus suber) — a Mediterranean native — is used to create cork products. This one grows in Cady Mall. The brown cones of the Canary Island pine (Pinus canariensis) grow to 4 to 9 inches long. This one is near the Memorial Union. The pink and yellow blooms of this tree, known both as Chinese Lantern and Kalahari Christmas tree (Dichrostachys cinerea), bloom from summer to early winter. The Chinese Lantern tree — this one on Tyler Mall — is native to Africa. It grows both colorful flowers and a black fruit that coils as it grows. The Aleppo pine (Pinus halepensis) — this one near the Memorial Union — is native to the Mediterranean. Its sturdy wood was once used by Romans for shipbuilding. The Lignum vitae tree, on Tyler Mall, is native to the dry coastal areas of Central America. The White Sapote tree (Casimiroa edulus) in the Secret Garden courtyard is the only tree of its kind on campus. A native of Southern Mexico related to citrus, White Sapote fruit has a creamy, custard-like texture with a flavor reminiscent of pear, apricot and banana. This fig tree, next to the Student Services Building, is one of several plants on campus with edible fruit. A former international student himself, Holly Singh was recently named director of the International Students and Scholars Center at ASU. Daylight streams in through the windows, illuminating a corner office in the Student Services Building on Arizona State University’s Tempe campus as students shuffle by outside on their way to class. He recalls several instances when the English he learned growing up in his native India – where people typically speak British English – didn’t translate well to American English, resulting in an awkward situation. “Sometimes awkward situations are the ones you learn a lot from,” he said with a grin. Singh was recently named director of the International Students and Scholars Center at ASU where 8,851 international students represent more than 130 countries around the globe. An affable man with a long, salt-and-pepper beard, Singh has a passion for working with international students that is evident as he expounds on the obstacles many of them face when studying in the United States, which can vary depending on place of origin as well as individual upbringing. “There are two types of international students,” Singh said: those who are very familiar with the English language and are comfortable “putting themselves out there” with American students, and those who aren’t. Lately, Singh says, there have been more of the latter. As places like China and the Middle East have become more affluent, students from those regions have been coming to U.S. universities in greater numbers. The majority of ASU’s international students – 3,282 – came from China in 2014. International students from Saudi Arabia, Qatar and Kuwait increased by 29, 37 and 75 percent, respectively, from 2013 to 2014. Singh explains that although more people in those types of countries can now afford to send their children to America for an education, those countries also tend to be less likely to embrace Western culture, resulting in a greater number of international students who lack certain “soft skills,” such as knowing how to apply for an internship or network with professionals. Having been an international student himself, Singh has an inherent understanding of their situation and is working to make that transition easier for them. One of Singh’s main goals at ASU is to implement more robust professional development programs that will equip international students with the skills needed to be successful not just academically, but in their future careers. Kent Hopkins, vice provost of enrollment services, said Singh is the perfect person for the job. “Holly will be a meaningful addition to the ASU community. His compassion for international students and vision for the International Students and Scholars Center will help international students thrive at ASU,” Hopkins said. Recently, ASU established an international tuition rate to ensure the university’s ability to continue supporting the unique needs of international students. The rate is designed to keep tuition as affordable as possible while continuing to extend such services as immigration advising, academic enrichment and professional development through the ISSC, as well as enhanced career advising, internships and employment services. 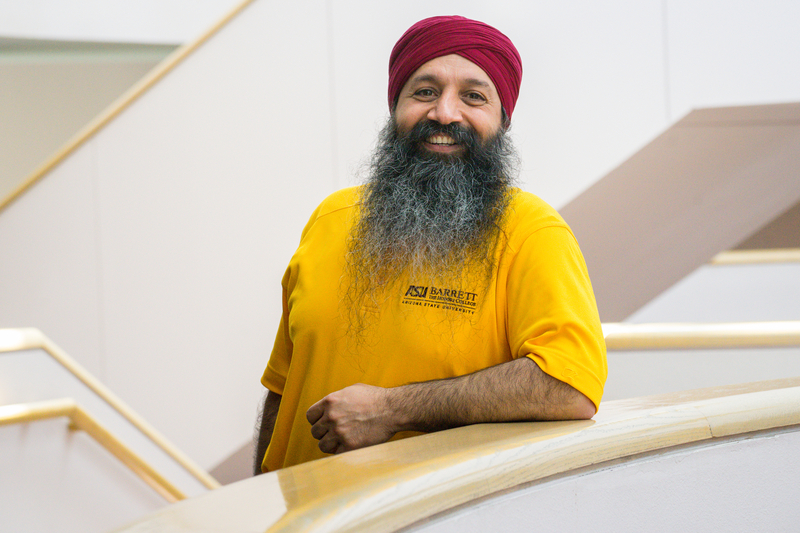 Another initiative Singh is overseeing involves bringing international students to ASU a week before classes begin so that they are better prepared once the semester begins. “I’ve already seen successful results [from similar initiatives] at Valparaiso University where the students were doing much better academically. So I have, on a smaller scale, seen that happen, and I want to experiment with that here at ASU,” Singh said. After earning both his bachelor’s and master’s degrees from Valparaiso, in 1997 Singh began working his way up from office assistant to director of the university’s international student office, a position he held since 2008. Now, he’s coming to ASU because he wants a bigger challenge. “There is a certain comfort level that comes with staying and working in the place where you matured, but for me to see if the things I did there would truly work in a bigger setting, that’s what I’m here to try. To experiment with scaling those things that were already successful on a smaller scale,” he said. Students like what they know of Singh’s plan. “That would be awesome,” said Neeraj Bahl, a software engineer graduate student from India. Though he immediately felt welcome and comfortable at ASU, he acknowledges that adjusting to the different academic system was difficult at times. “I expect [these new initiatives] to be helpful with getting students adjusted to education in America, and also to help them connect better with professors. That is something I can hope for,” he said.